While fictional pilots can pass the time during long flights by pranking their passengers, real pilots have to find other ways to stay awake. Unless, of course, you happen to be a great frigatebird, in which case you can just sleep on the wing, as a paper published in Nature Communications this August reported. There are numerous bird species that make long journeys over the ocean, during which time they presumably don’t have the luxury of getting a full night’s sleep. Alexei Vyssotski and colleagues decided to see how great frigatebirds (Fregata minor) handle the pressure of sleepiness while making one of those long trips. Great frigatebirds are typically found roosting around the Galapagos Islands. So, off to the Galapagos islands Vyssotski’s team went, capturing 14 female birds and surgically implanting EEG, accelerometer, and GPS sensors that allowed data to be recorded onto attached memory cards (the device, called Neurologger, was invented by Vyssotski at the ETH in Zurich, and also allows for collection of electrophysiological data from single neurons). EEG signals are often used to detect slow-wave sleep, which is characterized by high-amplitude, low frequency oscillations. The accelerometer provided signals related to head movements and wing flapping, while the GPS data in this experiment was used to track the birds’ locations as they made foraging trips over the ocean. (After collecting data, the researchers took the head-mounted data loggers off the birds and released them (the birds)). 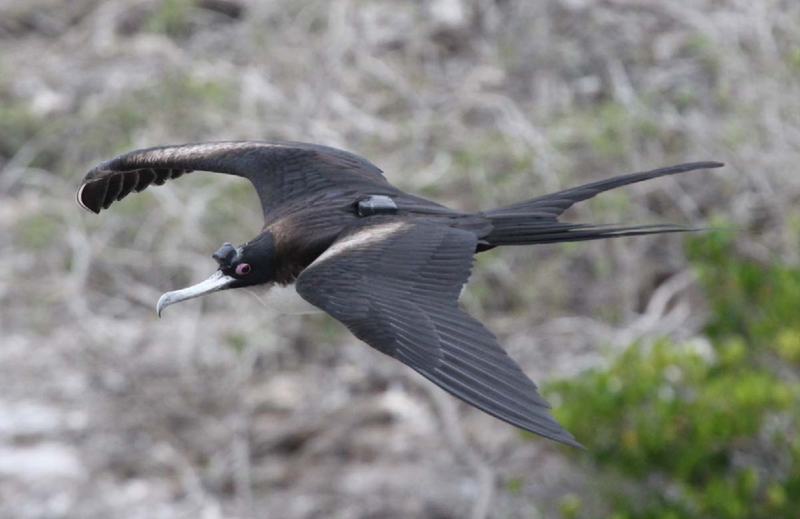 One of the great frigatebirds used in the study reported in Nature Communications, outfitted with EEG sensors, an accelerometer, and GPS. The GPS also showed that foraging for food, defined as altitudes under 20 meters, occurred primarily during the day and that the average altitude wasn’t different between day and night (around 136 meters). The accelerometer data showed that when the birds slept with one hemisphere, they tended to lean in the direction of that hemisphere. Presumably the contralateral eye would have been closed during uni-hemispheric sleep consequently biasing the bird’s flight path in the direction of the open eye. Perhaps the most fascinating result from this study was not that the birds could sleep with both hemispheres while flying, but that they spent a grand total of 2.89% of their flight time sleeping with one or both hemispheres. This is even more striking when compared with the 50% of the time the birds spent sleeping while on land. The data also showed that once the birds returned from their flights, they slept a little more than usual on land, suggesting that they really do need to catch up on the zzz’s after spending so little time sleeping during flight. An intriguing next step in this line of research would be to see exactly how alert and capable of learning or paying attention these birds are after several days with so little sleep. Do they just barely get by, soaring over the ocean like zombies? Or are they as sharp as after a full night’s rest? Would they spend so much time sleeping on land if they didn’t make such arduous journeys? Perhaps most exciting, what are the molecular mechanisms that allow the brain to keep functioning under so little sleep? One defining characteristic of sleep is a lack of responsiveness to stimulation. Unfortunately the researchers could not directly test the birds’ responsiveness by poking them as they coasted over the waves. Lack of responses to stimulation, along with closed eyes (not measured here either) would be two pieces of evidence that really support the claim that the high-amplitude, low frequency activity in the EEG actually reflects sleep. Without this, the EEG data may be interpreted to show the local “sleep” that Tononi described more than a decade ago. Whether they truly do sleep on the wing or not, these magnificent creatures manage to stay in the air for extraordinary amounts of time, so as far as the concern about them dropping into the ocean from sleepiness goes, John Cleese put it best: there is absolutely no cause for alarm.